No better way to wrap up a long month than with some happy mail! Along with this wonderful H2H prize package from Katie Q who blogs at Katie's Salt March Path. Thank you Katie!! All the little extra were so kind and thoughtful. I love them! I especially can't wait to play with this Oink A Doodle Moo jelly roll! Stop by for Tuesday Archives tomorrow as we begin with themes in the letter E.
Tomorrow's archived themes: Easter and Echo Quliting. I had fun adding a yellow girl and house to my neighborhood today. I also moved the whole neighborhood to a larger design wall and I'm loving how they are coming together! This quilt top is going to be so fun to embellish. I'm envisioning appliqued trees, doors and windows along with a few button accents and perhaps some yoyo flowers added to those green lawns. Looking forward to adding next month's color. I'm behind on all my sewing. I haven't even looked at my yellows for the June RSC and my ALYoF June Goal still sits exactly where it's been. But that's okay! I have five days of summer school left then watch me sew. And so far, it looks like I have a sewing weekend coming up, which means I just may meet those June goals yet! Yah! Just curious, what are your weekend plans? Tuesday Archives #17: Dogs and Dots! Welcome to the linky party that let's you rejuvenate your old quilting/sewing posts! I'm so glad you stopped by as this week is all about sharing everything and anything in the themes of dogs and dots! 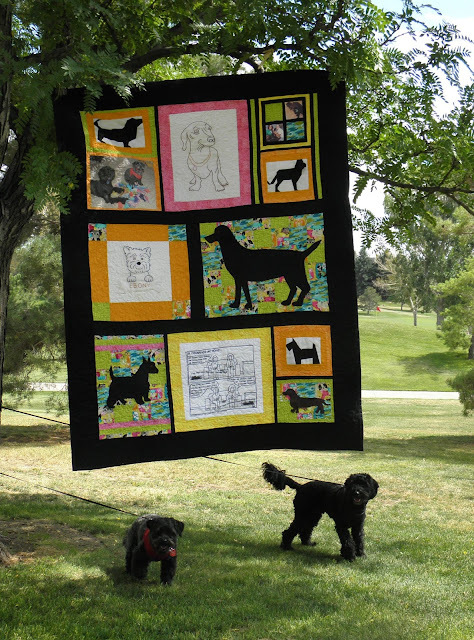 But I do have to say, for this week's highlight I looked forward to sharing this wonderful dog quilt made last summer by blogging friend Marianne at The Adventurous Quilter . So many cool details and techniques on this one! Be sure to grab yourself a highlighted button from above Marianne! Okay...who doesn't just love polka-dots!?! Don't they just inspire you to play! I got my Hexi back! We were off on a quick road trip yesterday to move our youngest daughter home from college and I was able to get an entire hexi flower sewn. Felt soooo good to be hand sewing again. This will be part of my Hexagon Memory Quilt. I plan to pre-cut a few more flowers to have on hand for some more relaxing summer sewing. Off to link up with other slow stitchers at Kathy's Sunday Linky. Here it is all finished. Cousin Amber had to get in the picture and we really love the scrappy binding! This quilt is soooo soft and warm!! I used all my left over flannel and created strips for the back. I really like how it came out. This quilt will see many more adventures than me, as my dad will use it in their motorhome during their summer travels. And here's where it will be used by my dad in their motorhome while he spends afternoons watching golf and baseball all cozy and warm. The perfect quilty hug don't ya think! I didn't really realize that this week celebrates my first year of blogging, until my mom commented the other day on how much progress I've made in my quilting life over the past year. But yep! It was a year ago today that I transitioned from being a curious blog reader to a creative blog writer! It's so wierd to remember how nervous and unsure I was. You can check out my first post in the linky party below. Have you gone back and read your first post lately? Pretty fun! Remember those first posts when your only "traffic sources" where spammers and/or wierdos and you were begging your family members to comment just to make sure your comment button worked!!! LOL!I love this virtual quilting guild we are all creating and am curious of what your first post looks like and says about you! Just for fun....feel welcome to share. Directional Prints are so much fun yet can be a little confusing to use. I found this informative post on identifying and using directional prints at Sew, Sew, Happy. Seriously, any and all projects that include directional prints are welcome today. Wouldn't these make for wonderful applique leaves? I'm creating this as part of my life and learning posts for quilting is one thing that I'm learning truly comforts me. It lets me be creative, expressive and quiet. I find comfort in the hum of the sewing machine and in slipping a needle through the edge of a quilt as I bind it's finishing touches. I find joy in the creation and gifting of quilts. Are you a parent to adult children? If so, isn't it a unique transition? I'm learning that in life, sometimes the only thing we can control is how we react to moments. It's rewarding and overwhelming all at the same time. I'm learning to accept and respect their decisions that may be different than our own. I'm learning to replace my own worries and concerns with faith and trust in how we raised our children. Curious what parenting life lessons you may be learning along the way? As a nurturer, I'm admittedly learning how to not let my own emotions and energies overwhelm me during this transition. I'm learning to take care of myself first and not my children. 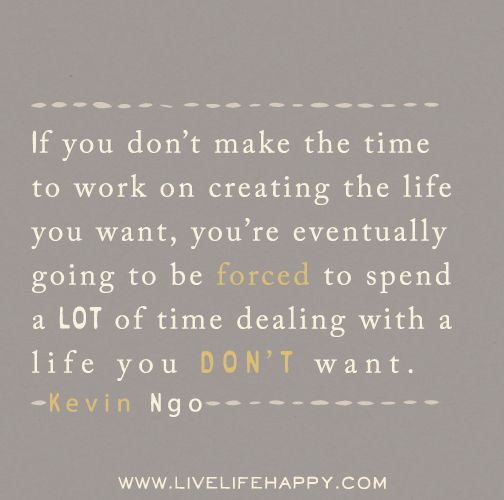 A weird, yet inspiring time in my life that I notices actually helps them that I do this! 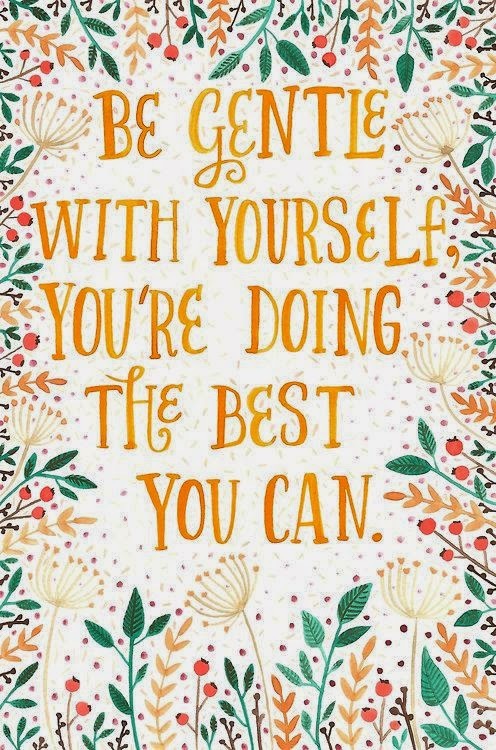 I take comfort in knowing that I have and am doing the best I can. I'm reminded to be gentle with myself and not loose my own balance in life, when theirs falls out of balance. I'm grateful, happy and proud of the life I created that includes: health, family, marriage to my very best friend, teaching, walking, and this wonderful hobby of ours. THANK YOU for all your comments on my previous post. The wood of the cabinet was not in very good condition, so my dad decided to sand it down and restored it to "fit" into our primitive decor using a black satin spray paint. I love it so much that I decided to set it up next to a window in our diningroom. I plan to follow up on all your references and once I get the machine up & going I think this will be a perfect spot to start sewing my eye spy quilt. Meanwhile, the rest of my weekend will be spent enjoying a household of family. Umm...no body told me being a grandma meant rearranging all my lower kitchen cabinets! LOL! Look what $15.00 bought me! For FIVE DOLLARS...and it works! I seriously have no clue about either of these. (LOL!) But we were out garage sale hunting for a high chair and came across them. On day one, they wanted $100.00 for them both...by late Sunday afternoon...they were lined up on the sidewalk just waiting for my final return! The best $15.00 I've spent in a long time don't ya think!? I can't wait to research these and get them busy sewing. I guarantee future posts. But in the mean time, if you have any websites you would recommend me to use to start my research, please do leave them in the comments, I'd be sooo appreciative. Linking up with my blogging buddy Marianne at her linky: Thrift Thursday and a few other linky parties that are on my "party" page. Check them out. Tuesday Archives #15: Displayed Quilts & Diamonds! Welcome to the linky party that let's you rejuvenate your old quilting/sewing posts! I'm so glad you stopped by as this week is all about sharing how we Display our Quilts and well, Diamonds, a girl's best friend! 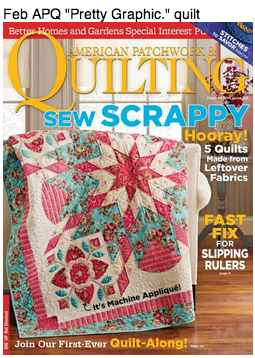 My copy of this February issue has a few sticky notes throughout, as I want to make a Diamond Medallion quilt like this one day. I've been seeing Diamond quilts popping up all over the place and I'm not sure if it's because I've been busy admiring them or if they are hip right now...never the less...please do share your Diamonds with us! Stash Busting with my Mom! In January, this pile of fabric did not make my 2014 Goal List. I originally bought this as a kit about two years ago to make this basket pattern for my mom. The colors are beautiful and favorites of my mom. But, as I have progressed as a quilter, I realize I do not like detailed patterns like this, so the fabric has sat. Well, my parents are visiting for two weeks and yesterday found my mom and I "relooking" at this fabric. After searching through patterns and with the help of her cocker, Amber, we choose to make these into a simple chevron pattern. After almost an hour of us saying: "Move that pink one there, and that brown one there"....we were both very pleased with the end result and I can't wait to get cutting. Mom and I certainly having fun playing with fabric! MyTwister is a Flimsy Finish! H2H Finale: Whimsical Flower Garden!